New green buds are visible on the end of every branch, flowers are beginning to unfurl, mornings are interrupted with the high-pitched squeaks of baby birds…it seems that spring is finally here! And now that it’s spring, what could be better than a romantic walk amongst the Smoky Mountain wildflowers? Well, how about spending an evening in, afterwards, with just the two of you, relaxing in your own private Gatlinburg cabin, enjoying all the luxuries your cabin has to offer? The Smokies is home to some serious opportunities for romance. Hiking trails perfect for couples in the Great Smoky Mountains National Park include the incredibly picturesque hike to Charles Bunion, which is on a section of the Appalachian Trail, and offers unbelievable vistas of the surrounding mountains and valleys, and the hike to Rainbow Falls, which features signature wildflowers, including the pink lady’s slipper and wild rhododendrons, as well as the scenic Falls themselves. One event, however, easily stands out as one of the most romantic things the region has to offer, if not the whole United States. The Smoky Mountains are home to the famous “synchronous fireflies,” so named because they each flash their lights at exactly the same time. They don’t do this all year – they flash their lights only during a week in late spring and early summer, when the fireflies reach adulthood and attempt to find a mate during their final 2 to 3 weeks of life. It’s beautiful, it’s unique, and the only place to see it in the western hemisphere is in the Smoky Mountains. Looking for a private cabin with a hot tub, a fireplace, your own porch, and plenty of amenities? Check out A Great Escape or A Mountain Hideaway! Each of these Gatlinburg cabin rentals also includes its own pool table, as well as access to a swimming pool and tennis courts in season. 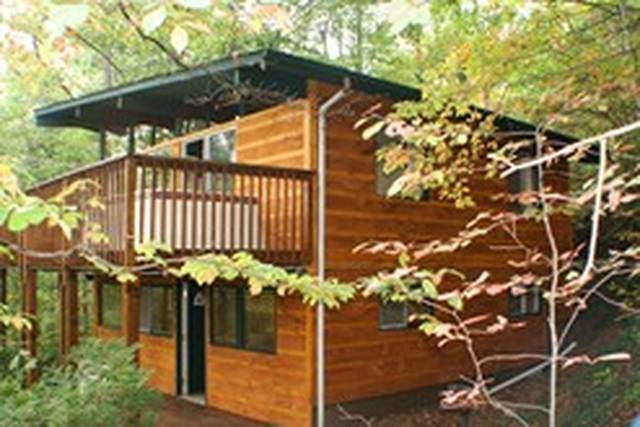 Both also feature easy access to the Park, as well as to downtown Gatlinburg. A Great Escape also offers a special double-sided fireplace that can be viewed from both the living room and the bedroom, for a seamless transition between day and night. A Mountain Hideaway has virtues of its own, including a secluded “honeymoon” location in a wooded setting, a wraparound porch, and, best of all, no WiFi, so the interruptions can be kept to a minimum and you experience perfect seclusion with your partner. After all, what could be more romantic than relaxing in your own Jacuzzi, feeling the cool spring evening breezes, sharing a bottle of local wine, and gazing out at the evening mists hovering over the mountains? True Love Lasts – Our Cabins Won’t! Coordinating two schedules can be tricky; don’t let someone else book the cabin of your dreams on the weekend the two of you are most available. Reach out to Ski Mountain Chalets today and let them set you up with an incredibly romantic Gatlinburg cabin — before it’s too late!